Forest communications experts from nine countries in Eastern Europe, the Caucasus and Central Asia have agreed to strengthen communications and boost the visibility of forestry issues in the region. Representatives from Armenia, Azerbaijan, Belarus, Georgia, Kazakhstan, Kyrgyzstan, Tajikistan, Uzbekistan and the Russian Federation committed to setting up a regional sub group on forest issues of specific relevance to the region within the UNECE/FAO Forest Communicators Network (FCN). The commitment was the result of the first regional workshop on forest communication for countries from Eastern Europe, Caucasus and Central Asia, which was held in St Petersburg, Russian Federation, 1-3 June. At the workshop, experts from government agencies, international organizations and NGOs shared information and experiences regarding forest communication, identified communication challenges and opportunities, and analyzed successful case studies and effective communication tools. 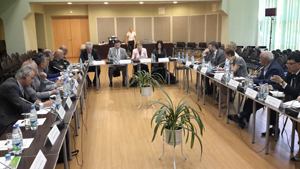 The meeting was organized by FAO and the Federal Forestry Agency of the Russian Federation, with support from Austria, Finland and the United Nations UNECE/FAO FCN. Alexander Panfilov, Deputy Head of the Russian Federal Forestry Agency, and Eugenia Serova, Director of FAO’s Liaison Office with the Russian Federation, opened the meeting. The UNECE/FAO FCN already counts almost 200 members and aims to improve the ability of the forest sector to communicate effectively within and outside the sector by providing a forum for international cooperation and developing the professionalism of forest communicators. FAO has facilitated the creation of a further five networks in Africa, Asia-Pacific, Mediterranean and the Near East, and Latin America and the Caribbean. For more information on regional forest communicators networks, please visit http://www.fao.org/forestry/communication-toolkit/76354/en/.